Just some 30 minutes by train from Barcelona, this beach is between the old town and the port in Sitges, nestled in a neighbourhood with a history as a fishing village. It's a family beach frequented by locals, with more than 200 metres of coastline. From your spot on the sand you can take in magnificent views of the old town, located on a small hill overlooking the Mediterranean. The beach offers an array of services and is adapted for disabled visitors. 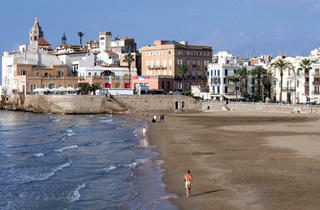 Getting there: About every 15 minutes there's a Rodalies de Renfe train that joins Barcelona (Sants station) to Sitges. By car take the C-32, C-31 or A7 motorways.